New York City is a metropolis in constant flux—always reinventing and reorganizing itself to suit the whims of its populace. Our friends at Oobject have assembled some of the best and most outlandish ideas to "improve" the Big Apple. 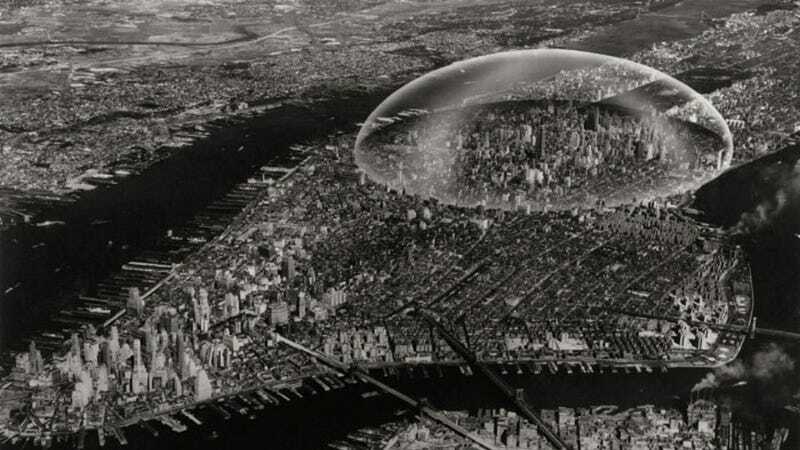 When you've seen what NYC could have been, check out these futuristic megastructures, the evolution of the NYC skyline, and these images of the real Gotham. Unlike many of the other designs here, this was not just conceptual, the corner stone for it still exists and Lindenthal designed the Manhattan and Williamsburg bridges,which makes the statistics about it all the more incredible. "The bridge was to be 6,000 feet long (nearly twice the length of the George Washington Bridge), 200 feet wide, and 200 feet above the river. It was designed to carry 12 railroads, 24 lanes of traffic, and 2 pedestrian promenades." The towers would have been taller than the Woolworth building. Superstudio were a seminal Italian conceptual architecture group. In this proposal the planet would be covered in a continuous structure based on a ruthlessly consistent grid. We tend to associate Battery Park with Battery Park City, which is on the opposite side of the tip of Manhattan from this scheme. Its a great shame that these were never built, because what was is possibly the worst of all the modernist developments in NY. Each residential block would have been 100 floors and house 45,000 people.